Reverie, an Arts & Crafts style mural, was created in 2006 and designed to capture the spirit of the Arts & Crafts movement. Its companion piece is Gallantry. This tile mosaic measures approximately 17" high by 12" wide. The tiles are 1/2" thick. Reverie consists of 4 large sections plus 20 border pieces. The tiles have a flat surface with black grout lines that define the shapes and enhance the mosaic effect. 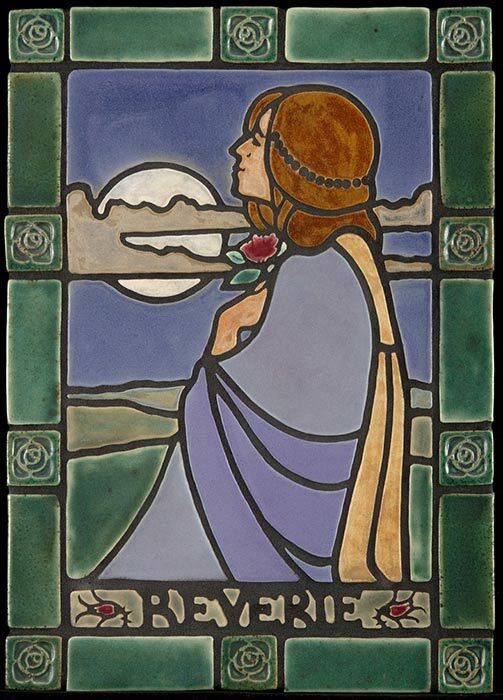 Reverie has the look and feel of a carefully pieced-together image, much like a stained glass window, but made of tile. We can create a customized Reverie mosaic in colors of your choice. This image is only an example. Options include changing the hair color, garments, landscape and the sky effects. The border tiles can also be made in a range of glaze colors. Colors shown: pine green border, blue violet and emily purple cloak, Ravenstone blue sky, textured amber hair, and gray green in the distant hills.